OUR PRICE: $10.56 - Join Rewards Get $1 Dance Dollars On This Item! Sansha's "Star Split" canvas ballet shoe provides flexibility with a split-sole design. Other features include a drawstring and suede sole patches. Pre-sewn single elastic attached. My daughter could not even use these shoes because they were too small. The size chart was inaccurate. I bought these for my daughters.The shoes are cute, but run small. I am assuming because they are made of canvas material there is NO stretch. I will return and buy the leather ones. We sell these shoes at our studio and the only negative comments I get are about the sizing. Even then, these shoes are definitely worth it. These ballet slippers would be great if the sizing was correct. I ordered them for my daughter, referred to the size chart before ordering, and the shoes were so small that she could barely get them on her feet. Based on similar reviews (that I should have read prior to purchasing--my bad), this seems to be a common issue with this brand. This will be the 2nd time I'm returning this shoe to get the next size up. My daughter wears a size 1 (she's 7 years old). We bought this ballet shoe for her last year. We naturally bought the next size up. They were too small. So, again, we bought the next size up. Still to small (they actually fit in the way that they're "just" right, but you know your toes are about to kill you if you grow anymore). So naturally, we have to go up, yet another size. This latest one we purchased is a size "H" and the sizing chart shows it fits Children's shoe size "3.0-3.5" ARE YOU KIDDING ME? So, now we're getting size "I" for child's foot size "4.0". (Remember, she wears a size 1 in regular child street shoe). So heads up - these are great, but the sizing is OFF. We have bought these canvas slippers because we love them and they are needed for class. To make it easier for moms trying to figure out sizing the size A is 6.25 inches which is equivalent to 8.5-9 ballet slipper from Payless Shoes. So just have your child try on a pair at Payless and go 2 sizes up based on the number provided in the chart. Shoes are canvas and will fit wider feet but may need to size up a bit more to make up for the material that is used for girth. My 5 yr old in a sz 11.5 street shoe fits a sz D nicely but I am going to size her up to an sz E for longer wear and just pull the string like I did with her current pair will is in great condition and will be too small by the end of December. My 2nd girl is street shoe 6.5 and I know the sz A I pre-bought will fit her when her she need new ballet slippers next July with room to grow. THese are WAY too small. The size chart is inaccurate. I agree order 2-3 sizes up. When ordering these shoes, go UP by 2 sizes (2 or 3 letters depending on what size). For instance if your child wears a size 2 street shoe. The chart says to order an "F". You would actually need to order an "I" which is 2 sizes bigger but 3 letters up. If your child wears a 10 street shoe you would order a C instead of an A which is 2 sizes up and 2 letters up. It's a great shoe if only they could get the size chart corrected! Hope this helps! Had to return these slippers; ordered size 2- 2 1/2. Too small. May reorder if I do not have any issues with return process. I have ordered these twice now. My daughter wears a size 1 street shoe, so I ordered an EM first, too small, next went up to FM again too small. The sizing chart for these ballet shoes are waaaaay off. They need to adjust so that people like me do not have to continually order, return, reorder etc. I suppose there is a chance I am reading the chart wrong, if I am shame on me, but I will no longer purchase shoes on line because of this way too much of a hassel. I usually just go the instant gratification route and pick up a pair of slippers at Target. We needed specific ones for my little one's upcoming performance. Bought these based on her usual size 1 and it just barely fits. Ordered them at work when she wasn't there and was worried about timeliness...next time I'll wait and measure first. Great slipper otherwise! After reading reviews I went with one size bigger. Daughter is an 11 so I ordered the C which says it fits 12-12.5. Arrived the next day. They looked really small, but I still wanted to see if they would fit (this is her first pair) Slipped right on and tightened them for a perfect fit! She played around the house in them for a bit and didn't want to take them off! I ordered a size C (size 12) according to the size chart. Unfortunately, they were way too small. I could bare put them on my daughter's foot (11.5). After reading the reviews, I've decided to go two sizes up. I'm hoping these will work out *crosses fingers*. I'm sure the bungee string will help if they're a little loose. Other than that, they seem to be of good quality. The only problem I'm having with the Sansha Ballet slippers is that they're running extremely small. If you have a pair of Sansha's it's easy, you just go up in size, but for my Daughter this was the first time converting to a Sansha pair and the conversion scale is just completely wrong. Size J is supposed to be equivalent to a street size 4.5 which is a size bigger than my Daughter's street shoes currently are and the Sansha ballet slippers are too tight. She can get them on, but they're too tight, which means after a bit of serious training her toes will poke a hole through the front. They'll do for the Summer ballet classes right now, but when the regular Season restarts in September she'll need a bigger pair. So even though I went a size bigger on the Sansha's than the conversion suggested, they're too tight. Other than the sizing issue, Sansha Ballet Slippers are great, they're nicely constructed and very comfortable canvas. We always prefer canvas shoes for ballet after years of trial and error with my oldest girl, and we always begin with split sole as it's the easiest transition. These run true to size, seem good and durable for a beginners shoe and great price! These were tiny! I ordered according to the sizing chart, my daughter is a size 12-12.5 shoe, ordered the 15c and she couldn't squeeze her foot in these if she needed to! They looked baby sized! Order TWO sizes bigger than street shoe! I ordered these in size BM for my son (3 yrs old, size 11 street shoe), and they were WAY too tight. For him to have any growing room at all, I'll have to reorder these in at least a D.
i purchased this in the correct size; however, it runs really big. i do like it as a new smaller item was purchased and the feel, fit, and quality is great. The leather is better than the canvas; however, they are both great and soft on the eyes. I ordered the size according to the size chart, but the shoes were still too small. I then ordered the next size up, and will return the first pair ordered. I ordered my daughter a size D (for shoe size 13)even though she wears a size 11 shoe, They are soft and comfortable with room to grow. These are the second pair I have ordered for her, we bought the same shoes last year as well. My daughter is 5 years old. Luckily I read others reviews before ordering. My daughter wears a 12 1/2 street size so I ordered her a size F. Very fast delivery, and they fit good with room to grow thankfully. I did have to pull the strings to tighten, but overall happy. I measured my daughters foot according to their sizing suggestions and the ballet shoes were so small she could barely squeeze it on her foot. Everything is perfect about the shoes, the exact same as our old ones that we grew out of. We wish we had the mesh bag that came with the ones from our studio but that is OK. I will take the lower price for the exact pair of shoes over anything!!!! After years of leather, we switched to canvas and have found these to be our favorite. My daughter dances 5-7 hours per week so she really beats them up. They take the hit and (if she doesn't grow out of them first) usually hold up around six months. For the money, you can't beat them. She also says they are the most comfortable. I followed the ratings and ordered a size above her street size. Painfully small. So, I measured her feet with a tape measure and ordered according to the sizing chart. She can still barely walk in them. I have to purchase ANOTHER pair, so I'll end up spending over three times the price! Very pleased with the purchase, but would have bought wrong size if I had not read the reviews. The shoes are not meant to last very long, but my daughter's feet are still growing rapidly, so that is fine. Bought the size Child B. My daughter wears street size 8 1/2. 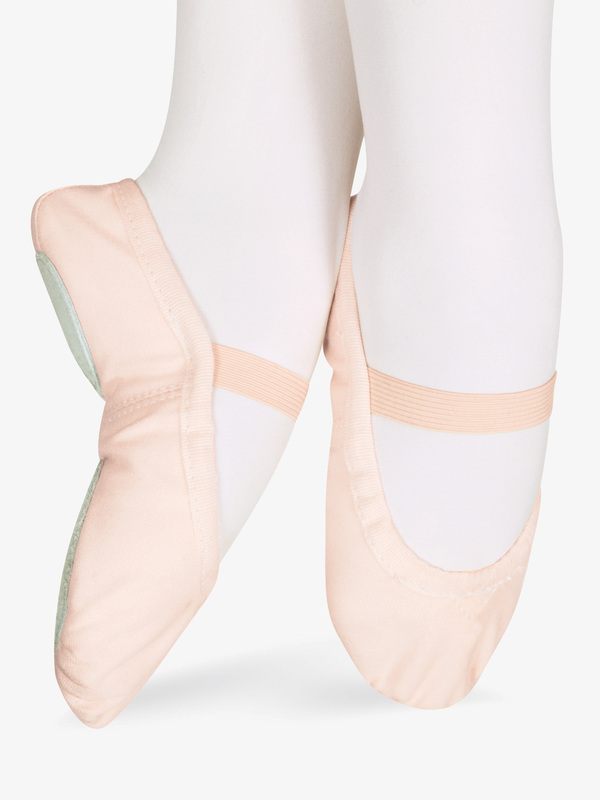 I am a dancer- and I ordered these ballet shoes for my niece to wear for her recital so she would have clean canvas shoes and they were at a great price since we would be purchasing a new pair when her classes begin again in August. The size chart says to order up a size from the street shoe- but the reviews said they size up they had ordered was still snug- so I ordered a size and a half up. She couldn't even get them over her heel. The shoes is beautiful and soft- but the sixing is incredibly incorrect. shoes didn't even come close to fitting. I ordered per sizing for street size of a 3 and she wears a street size 2. So I even went big and the shoes were way too small. The sizing instructions should tell people that. Especially when you charge $6 to return them plus you pay the shipping to receive and return. Very disappointed. It isn't even worth returning them. The shoe is a good value, however I had to find someone in her class with a smaller foot to give them to (it is easier than doing the exchange that takes way too long) even though I ordered a size bigger than he street shoe. Size G with a 7 year old and street size 13 - 1 was fine for a while and when she pulled the string out for the second time because she was saying they were too small she has been able to wear it without the string for this short period she was without any. buying H and I cause they last long enough. May need second for performances if used all year and requirements are strict. This is the second pair of these shoes that I have purchase for my daughter. She wears a street size 1 and I purchased a G, which were a little big, but by pulling the string, they fit comfortably with a little room to grow into. My daughter said these are the most comfortable shoes she has had (her first canvas pair, she had worn leather previously). The price can't be beat. I purchased the shoes in H for when she grows out of the G. The color is great, and on stage- looks the same as the other girls' shoes. I was initially worried that the canvas would soil more quickly than leather, but that does not seem to be happening. Awesome price, fast shipping- will continue to buy these shoes as she grows! I just got them, and they don´t fit her.... it´s a waist of money and time!!! Ordered the shoe a size bigger than needed and they did not fit. My daughter wears a USA street shoe size of 1. Her feet measure 7 1/4 inches and a 1 corresponds to 7 1/4 inches on the size chart BUT she most definitely wears an H which corresponds to a size 3!!! The H fits her very very snugly with no heel room or toe room at all. If I had ordered her the E it would have been 3 sizes off! So be sure and order 3 sizes bigger than what is suggested. These shoes came in so fast! I ordered them over the weekend and received them in time for class on Wednesday! My girl loves them! Glad these come in a wide. My daughter is picky about comfy toes and she likes these. The split sole is good for her class and the canvas is very flexible. I like the storage bag that comes with these. Bought these for my 4 year old, for her recital, she needed pink shoes. Received these and they are peach, not pink. They also are wide, they don't fit her narrow foot at all. You get what you pay for when you purchase these shoes. They are cheap and look cheap. Sizing is way off! I cannot rate these as far as how they wear, as I bought these for my daughter when she outgrows her current shoes. I bought the C and D sizes since there seemed to be a lot of differences among reviewers as to how these fit, but they are both currently too big. Her street size is a 9 or 9.5, and she now wears Bloch Dansofts in 8.5. I anticipate her being able to wear the Cs next year. My only concern is that they might end up being a little baggy on her because she has very narrow feet and at first glance, they seem wide. But maybe after wearing them they will conform better to her feet. It's hard to find ballet slippers that are narrow. I like that they come with a bag. That's nice. Considering I paid 18.50 for her current shoes at our local dance shop, I really hope these work out because you can't beat the price. I bought these in a size C for my 4-year-old that normally wears a size 9.5. They are a little big on her, but perfect for in a few months. I was a ballet dancer and I would love to have had these for class. I like these shoes and it is cheap but the sizes are weird. Hi there. My daughters foot measures at 7.5" she typically wears a size 13 shoe. If I follow the size chart it appears that I would order her a size 3/3.5. Is that correct. Thank you! According to Sansha, if her foot measures 7.5", she would order this shoe in size F.
It's not really just one slipper, is it? I would assume that they are sold in pairs but 'it' is always referred to in the singular on this page. This item would be sold in pairs. I WANT TO ORDER SIZE UK 0.5 AND I DON'T KNOW HOW TO CHOOSE THE CORRECT SIZE ON YOUR WEBSITE. CAN YOU HELP ME PLEASE? If the UK size is a 5 childrens shoe, this compares to a US size 6 in a childrens shoe. This shoe is not offered in that size, we have other options in a ballet slipper for that size. The options are S0205T and 205C.